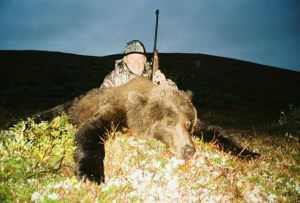 Alaska brown bear hunting is our passion. 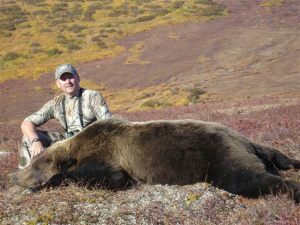 We are proud to offer our clients several different options for our Alaska brown bear hunts. 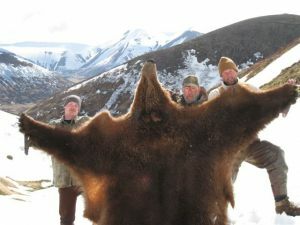 Allowing our clients the best possible opportunity to harvest an Alaska brown bear. Based upon the client’s physical abilities, trophy expectations, and financial means, we are able to place them on a hunt that will surpass their expectations. 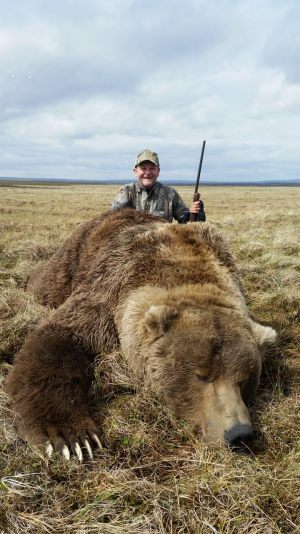 Depending on the year (even or odd) unit 9 is set up on a odd year fall season and an even year spring season, to ensure trophy brown bear management. 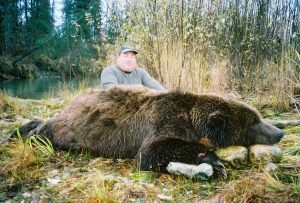 We offer two options for spring brown bear hunting. Spring hunting season on even years, starts May 10th and ends May 30th, and fall season starts October 1st and ends October 25th. 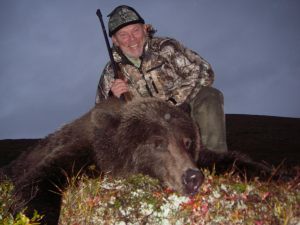 The Alaska Peninsula near Cold bay is our premier brown bear hunting area. This is an area we only hunt on even numbered spring years. 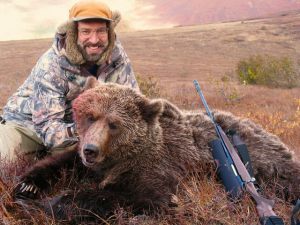 It is hands down the best location for trophy brown bear in Alaska. This region is as good if not better than Kodiak Island for huge coastal brown bear. The Aleutian Range with its 4000-foot peaks rising from the ocean’s edge makes the perfect backdrop for glassing giant coastal brown bear. 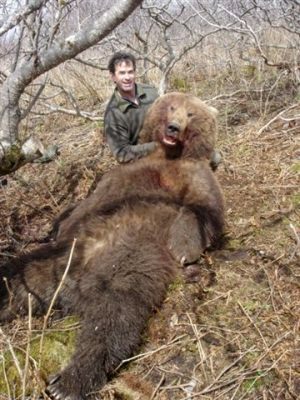 This is truly Alaska’s trophy brown bear area. Brown Bear in these two units (9E and D) can grow to more than 11 feet square, with skulls measuring over 30 inches. 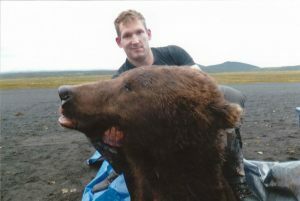 More SCI record book brown bear have been taken from these two units than any others in Alaska. 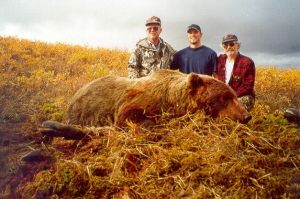 Our largest brown bear taken from here in 2008 measured 11.6 feet squared, with a skull measurement of 30.5 inches. 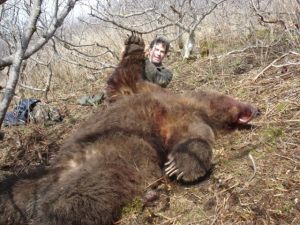 Ten foot brown bear are taken each spring by Alaska Wilderness Charters And Guiding clients on this hunt, and most brown bear taken will measure over 9 feet! 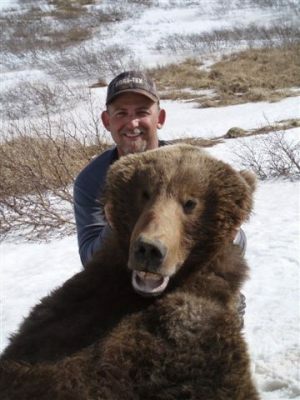 Many outfitters have never taken a true ten foot bear. 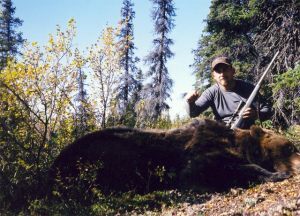 Hunting is done from a spike camp only accessed by a super cub with large tundra tires. We are continually checking on our camps and moving as conditions change. As winter looses its grip and snow melts, bears will emerge from their dens. We are continually looking for such activity and place camps accordingly. With our base camp closely located to the Bering Sea, we arealso searching the beaches looking for dead whales and walrus that have washed up on shore. 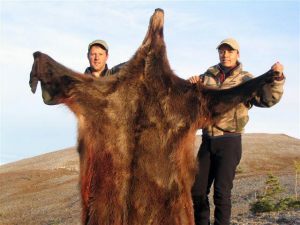 Brown bear, wolves, and wolverine will come to these carcasses to feed. Camps will be placed near these locations as well. Glassing mountainsides you will see brown bear, moose, caribou, wolves and wolverine. 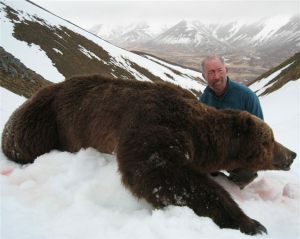 Brown bear will move off the mountains to the lower elevations looking for food and females. Quite often you will see large boars chasing both smaller boars and adult sows up and down the mountains. Sows with young cubs are at high risk. Large males will kill and eat young cubs for food, and to bring the female back into heat. 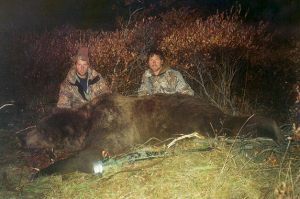 This has been witnessed first hand over the years while hunting for both brown bear and grizzly bear in the spring. 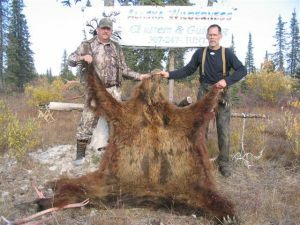 If you prefer hunting in the fall and are truly after a ten-foot brown bear you may want to concider our fall brown bear hunting area in unit 9E near Port Heiden. For this hunt you will fly from Anchorage to Port Heiden with Pen Air. Season dates for this area are from October 1st through the 25th of odd numbered years. 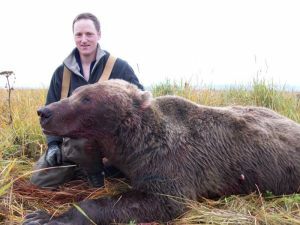 This part of the Alaska peninsula is managed by the state of Alaska to ensure trophy sized brown bear. 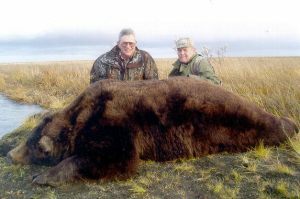 Over the years, many of our clients have taken record book brown bear on this hunt. 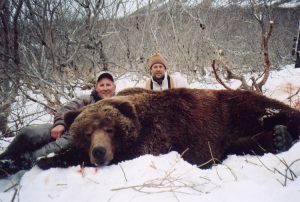 In this area we are looking for 9 foot plus brown bear that can weigh as much as 1400 pounds. 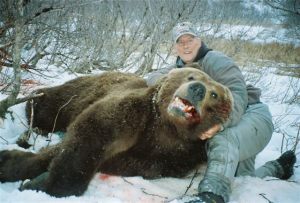 Each year we take brown bear that will qualify for SCI and Boone and Crockett. Hides can square 10.5 feet plus from this area. 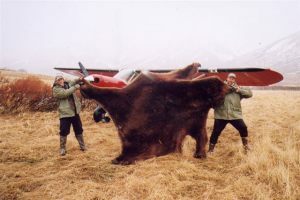 Hunting is done from spike camps that are only accessed by a super cub airplane equipped with large tundra tires. 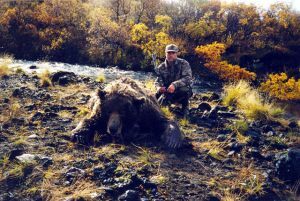 Hunting is primarily done in the low areas along the streams and rivers, that are full of returning sockeye and silver salmon. Brown bear will be feeding on salmon to put on the necessary weight needed to go into hibernation. After feeding, bears will lie in the thick alders. This is another location we place camps; these bedding areas have been very productive for us over the years as brown bear move off the rivers. We will move towards these bedding areas along the many deeply worn trails, waiting and glassing for big brown bear to return to the brush. The larger and older bears are most often the first to take cover in the dense alders, often returning right at daylight. 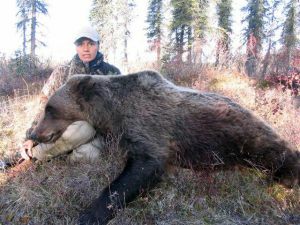 Hunters will be intercepting bear moving to and from their feeding grounds. 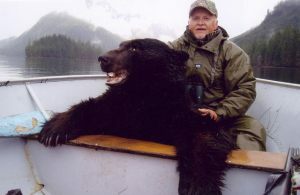 The average day is spent sitting along the river glassing for brown bear feeding on salmon. When doing so, sent control is a MUST!! It will make the hair stand up on your neck when you hear the water splashing from a large brown bear chasing salmon in the river as he is about to round the bend that you are sitting at! 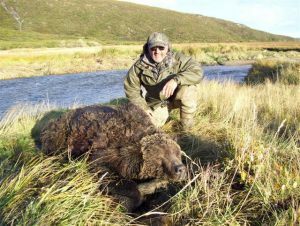 Bow hunting for brown bear can be very effective in low areas of the Alaska peninsula, as most of the streams start from an under ground spring. As salmon move up these systems, they reach a dead end in the stream, and begin to pool up by the hundreds. This makes for a perfect area to bow hunt. 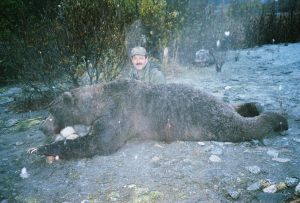 We have had numerous clients take record book brown bear with a bow in this area. 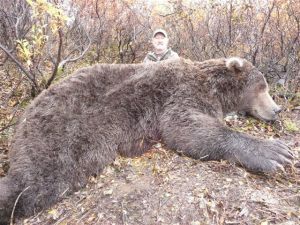 Most brown bear are taken less than 2 miles from our spike camps. Spring hunting is more physically demanding than fall hunting. 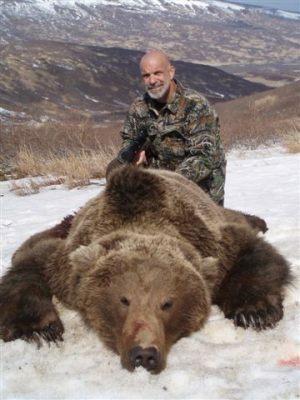 Hunters will need to be able to climb the hills or mountains to go after brown bear emerging from their dens high up in the mountains. Quite often you will see bear laying down high up in the mountains basking in the sun. Brown bear will remain close to the den for days before they move off any great distance. 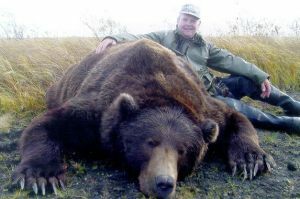 This is the ideal situation to find a big brown bear that has just dug itself out from the den and to remain close by for days allowing hunters to make a successful stalk. 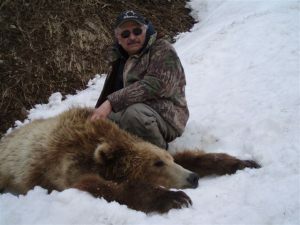 Brown bear and grizzly bear will go back in the den to sleep during the cool spring nights, and once again emerge mid day as the sun warms the hill or mountain side causing the den to fill with water from the melting spring snow. Depending on the snow conditions it may require snowshoes to travel up the valleys to the bear, but the good thing is, often the alders are still covered with snow allowing for easier and faster travel. 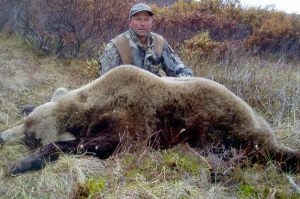 The biggest difference between spring versus fall brown bear and grizzly bear hunting is that the male brown bear and grizzly bear are more active during the spring due to the breeding season. Brown bear will lose as much as 30% of their body weight during hibernation, which forces them to feed throughout the day. The day light hours are also much longer in the spring giving hunters more time each day to hunt. 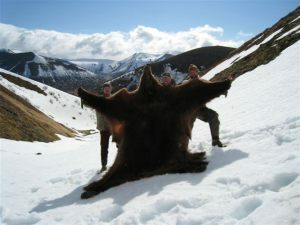 On a spring hunt you will be hunting in or near the mountains in which bear den, and days will be spent glassing snow-covered mountains; you may also see moose, wolves, caribou and wolverine. 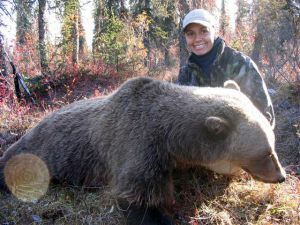 Fall hunting is primarily done along the many salmon streams by intercepting bears feeding on salmon. 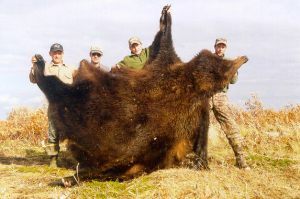 Brown bear breed in the spring, in May and June mature bores are searching for females that are in heat or sows with young cubs they can kill and eat. Killing the cubs will also bring the sow back into heat. With all of the salmon streams in the area, brown bear coming out of hibernation will work their way down the mountains to the rivers they left in late fall searching for food once again. 1) WHAT ARE THE PHYSICAL ABILITIES AND LIMITATIONS OF THE HUNTER? This is probably the most important factor! 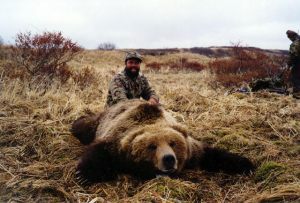 Spring brown bear hunting and grizzly bear hunting are both by far more physically demanding. 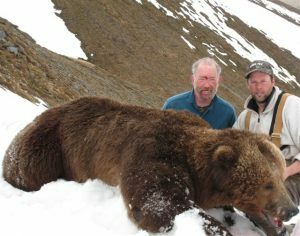 Most brown bear will be up in the mountains, while on a fall hunt they will be along the rivers (less vertical climbing). Fall hunting can involve more sitting while waiting for a bear to come close. In the spring you will be doing more hill climbing and glassing. For those of you that have hunted with me in the past - you know that sitting and waiting is not my thing. I go and try to make something happen! Fall bears will on average have shorter hair than a spring brown bear or grizzly. However, fall bears will have very even length hair generally free of rubs. Many fall bear have much nicer hides than spring bear. You must look closely at a spring bear to make sure it is not rubbed from lying in the den or sliding up and down the mountains in the snow. 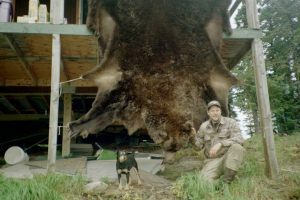 There is no better trophy than a spring brown bear hide in perfect condition! 3) WHAT AREA WILL YOU BE HUNTING? 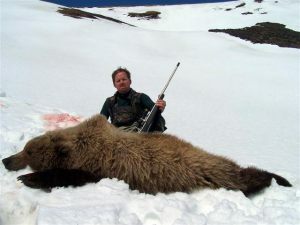 Not all brown bear hunting areas are good both spring and fall. This is why we choose to hunt different areas spring and fall. Most outfitters do not give you that option. We will take you to the very best areas both spring and fall. Weather will play a big part on your hunt. In theory spring weather is generally better than fall, but for those of you that have hunted in Alaska, you know how that can be. 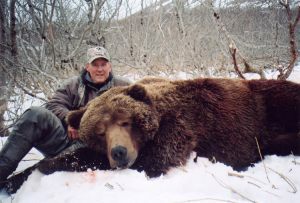 You can expect and will see bad weather on both a spring and fall brown bear or grizzly bear hunt (Count on it!). A cold late spring with deep snow will make the bears stay in their dens longer. If this is the case you will not see as many bears. Bad weather during a fall hunt will consist of high winds with driving rain; this will keep the bears bedded down in the thick alders. 5) WHAT YEAR CAN YOU HUNT, OR WANT TO HUNT? 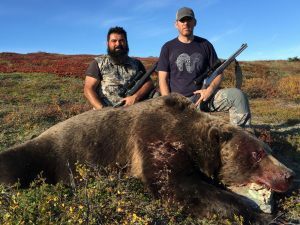 The Alaska Peninsula unit 9 has a unique season; we only can hunt on odd years during the fall and even years during the spring. This is a very important consideration; our three areas are all priced differently due to logistics and cost of operating. 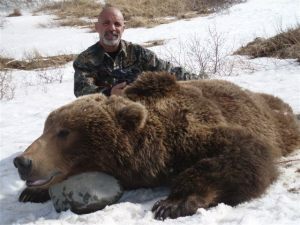 All three brown bear areas are excellent and you will have a very good chance at taking home a trophy, but maybe you can only afford to hunt grizzly bear, we have two options for that as well. 7) ARE YOU ELIGIBLE TO HUNT IN A SPECIFIED AREA? Unit 9 is a one brown bear every 4 regulatory years area. Our Grizzly bear areas are one bear every regulatory year. 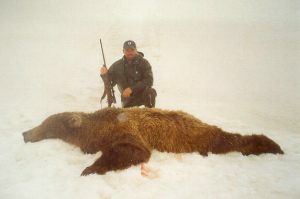 For more information on brown bear and grizzly bear hunting please CONTACT US. 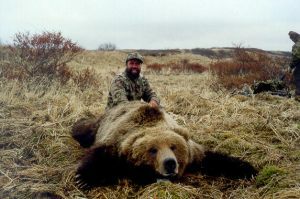 Brown bear hunting is our specialty and I would like to share my passion - hunting North America’s most coveted trophy.